New at Lake Monteux just 10 minutes, a water park has just opened, the SPASH WORLD !! After August 15 a 15 percent discount will be made and you will receive a welcome bottle of wine as a gift. A spacious and well equipped house. As a family of four, we had more than enough room. The girls enjoyed the swimming pool and we enjoyed the outside dining area. Unusually it had all the kitchen equipment we needed and came with plenty of stuff to keep the place clean & tidy. Our hosts were very welcoming and friendly. There is plenty to do and see in the region for 2 weeks (we only stayed for one). The immediate location wasn't ideal for us with no restaurants or bars within walking distance and not great for wandering out for a break. That said Avignon was only a short drive with ample free parking at the two park & rides. Overall we would recommend staying here. The positives are that the location is great for getting to the best parts of Provence. The owners are very friendly and warm and the house is clean and air conditioned. Unfortunately the walls are thin and the next door neighbours like to stay up very late playing music. While the garden is beautiful and lovely terrace for eating, the pool is little more than a plunge pool. Sorgue itself is not a pretty town and where the house is is a bit run down and industrial. The wifi didn't really work in the house and there was very little local information on things like market days, good restaurants, particularly nice places to go. Just a pile of tourist pamphlets. Local "inside knowledge" is always good. Our two families (of 8 people in total) had the pleasure of staying in this house for a week in July. Our hosts, Claudine and Gilbert were lovely and made us feel very welcome. We had to communicate in broken english as both hosts had minimal english. The house has a large back yard, which was perfect for us with small children. The pool was great after a day of sight seeing! There was a bbq, which was again, perfect for our group. Overall the house was great, however there were some kitchen essentials that we missed, like spatulas, bbq tongs, salad servers etc. We also came from far (Australia and South Africa) and didn't bring our own towels, so had to go buy towels, as their were no pool towels and only two bath towels provided. We had a great time though and would happily recommend this house for families travelling! The house is spacious and the pool was a wonderful treat after touring all day. Claudine was super friendly. Je remercie Stacie et son adorable fille de leur témoignage nous avons nous aussi apprécié de les rencontrer . 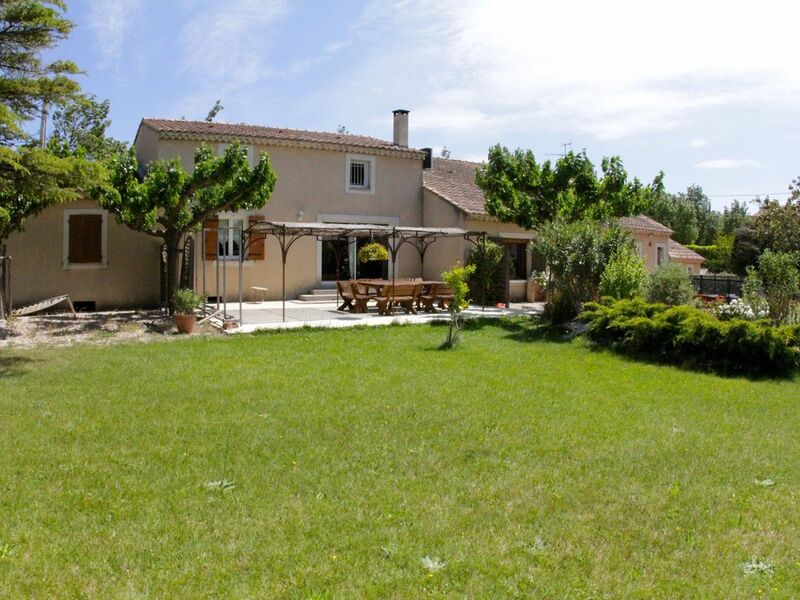 A great house with a great pool with most of Provence within close distance. Gourvernet family made us feel very welcome and was very helpful and accommodating for our children. If you go to Pont-du-Gard bring your swimwear and take a dip in the Rhône. Since Chateauneuf Du Pape is really close take a guided tour with "Provence and Wine" or take a up there Taxi and taste some great wines without worrying about driving. A beautiful spot. Seven of us stayed in this house; all of us highly satisfied. The house was well equipped, clean, and very spacious. The owners were extremely welcoming and kind. We thoroughly enjoyed our stay here - absolutely deserving of five stars!